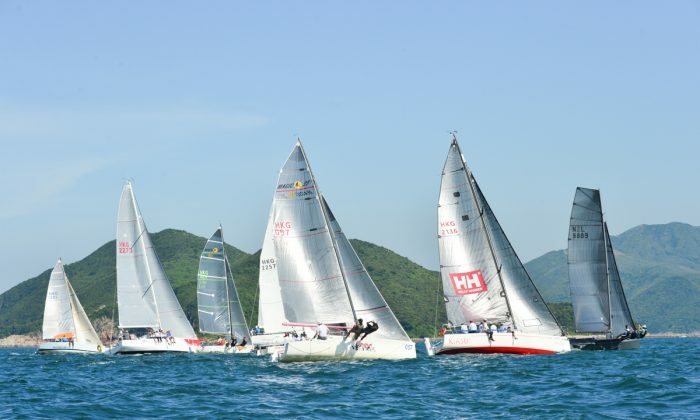 HONG KONG—Races 6 and 7 of the Hebe Haven Summer Saturday Series 2016 were held on Sunday July 23. A fleet of 36 boats sailed in a consistent10 knot south-westerly, over 2 geometric courses set inside Port Shelter by Race Officer, Club Commodore, CK Chan. Although Race 4 of the series was run successfully on Race Day 3 (Saturday July 9), the second race of that day, Race 5 was cancelled due to lack of wind. On completing Races 6 and 7, a total of 6 races have been run, allowing competitors to discard one result. In IRC Division “Lighthorse” continues to dominate with 2 more line honours and first places, leads the standings with 5 points net. “Moll” with 4th and 2nd finishes in these two races is lying in 2nd place on 16 points and “Vixen” 2nd and 3rd in these races is close behind on 18 points. There is then a gap to “Acturus” and “Kiasu” both on 29 points and “Stella” on 30 points. Like “Lighthorse”, “Merlin” heads the Sportsboat Division also with 5 points net after another 2 wins in Races 6 and 7. “Ricochet” is lying second on 12 points and “Freefire It’s My Pleasure” is now 3rd on 17 points. Two good performances by “Freefire It’s My Pleasure” on the final race day of the series (Saturday Aug 6), with 2 discards in prospect, could set up a close contest between themselves and “Ricochet” for 2nd place. In Race 6, “Freefire It’s My Pleasure” came 2nd, “Brace, Brace, Brace” took line honours but came 3rd (on corrected time) and “Ricochet” was pushed into 4th place. In Race 7, “Ricochet” took 2nd place. “Freefire It’s My Pleasure” went On Course Side (OCS) at the start, did not do the necessary restart, so was disqualified. “Brace” ran into difficulties and although taking line honours, finished in 6th place. In HKPN, “X-Terminator” is still leading the field with 8 points net after 5th and 7st place finishes in Races 6 and 7 respectively. “Tara” finishing in 3rd and 2nd in these races moves into a clear 2ned place position on 12 points net at the expense of an under-crewed “Bits & Pieces” placed 9th and 8th in these 2 races. It is unlikely that “Bits” can recover 2nd place following these 2 poor results, and “Bits” must now battle for 3rd place with “Ichiban” on 22 points and “GA” on 24 points. In the Dragon Class, after discarding 1 result, “Puff” has taken over the top spot with 11 points, “Phyloong III” moves into 2nd place on 12 points net, one point ahead of previous leader “Wudi”. “Wudi” drops down 3rd place after finished down the order, in 7th and 5th places in these latest races. “Celines” is lying 4th with 18 points. “Wyuna” is in 5th place on 22 points after coming 3rd and 1st respectively in races 6 and 7. “Shiva” is in 6th place overall after winning Race 6. Day 5 of the Hebe Haven Typhoon Series takes place on Saturday July 30 (rather than the normal Sunday race day), for the Mirs Bay passage race. A return pursuit race (not part of the series) takes place, back to Hebe Haven, on Sunday July 31, 2016.